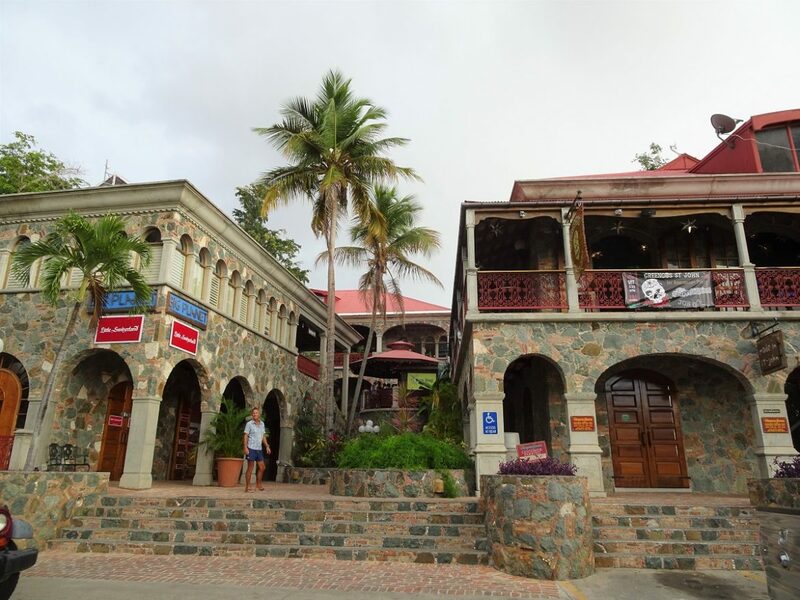 Sunday 17 Mar, USVI day 1: Motoring from Tortola to St.John and visit Cruz town. Today we depart BVI. We have been here 2 weeks. And although we haven’t managed to see everything we feel we have covered the highlights and now time to move on. USVI here we come. The trip isn’t far, only 2 miles Tortola to St. John! So there is no hurry to depart. But actually we should have been in a hurry! By the time we get to customs & immigration to check out, it’s mobbed with small day boats coming across for the day from USVI. Earlier there had been no one there at all and we could have been in and out in just 10 minutes. But now there are many people in the queue, each with a fist full of passports. The process is so slow and it must really put people off coming over for a day trip. 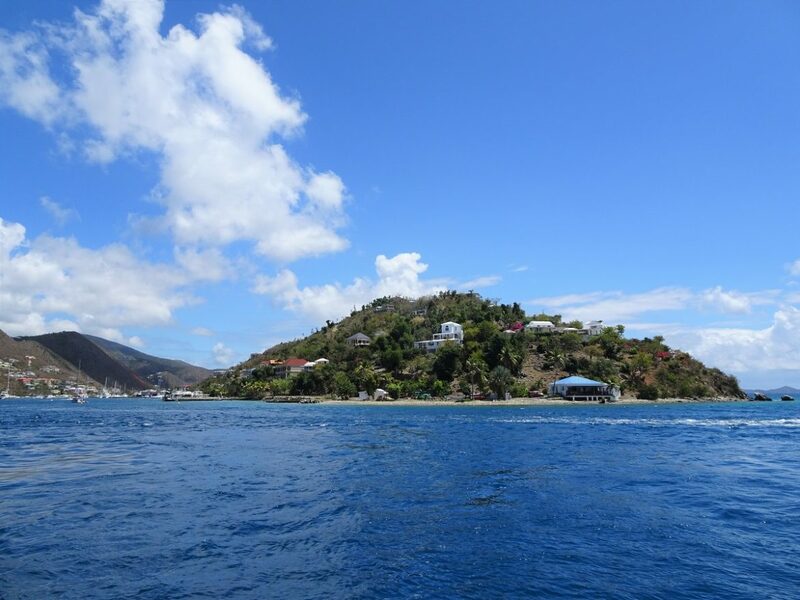 And this is just the BVI side, we guess they also have to check out and back into USVI too! By 1pm we are on our way. The wind is light and behind us, so we will just motor and make some water at the same time. Within 15 minutes we have crossed over into USVI waters and head along the north coast of St. John towards Cruz Bay where we have to check in. On the way we motor in and out of each bay to check them out. First Frances, Maho and Cinnamon Bays which are all in one big protected bay. Each has a wonderful golden sand beach backed by dense greenery and palm trees over hanging the sand, making them look picture perfect. They also each have a line of floats demarcating a swim area. So you cannot anchor near the beach. That’s a good thing. Propellers near swimmers is never healthy. But there are plenty of mooring buoys to pick up. We note that among a cluster of buoys is a small floating pontoon acting as a pay station. Interesting that this would work in a USA run island because such self-honesty wouldn’t work in any of the other Caribbean islands. And again we are reminded how civilized Americans are (in general!). Or maybe they are just much better at policing such things. Next bays are equally as pretty: Trunk Bay, Hawksnest and Caneel Bays. The last of these obviously used to have a very nice resort on it, but completely destroyed by Irma … or was it Maria? This is the zone where both of the 2017 CAT5 hurricanes hit, just 10 days apart. Can you imagine living through a CAT5 only to have a second one come by a week later?!!! All too soon we are at Cruz Bay. We try to go into the right little bay and pick up a buoy but there are none left. So we anchor just outside the bay in a place that we consider is not in the channel. After diving the anchor and seeing it nicely in sand, a guy comes passed and “advises” us we are anchored right in the middle of the ferry channel and we should move. He also tells us to anchor in the bay as he “anchors there all the time, no problem”. I’m pretty sure I can’t anchor in the bay, our keel is too deep. And although I’m also pretty sure we are not currently anchored in the channel we decide to re-anchor where no one can question us. But this plan doesn’t work because it’s rocky and the anchor just drags. Attempted few times, didn’t work. So we do eventually try to anchor in the bay. We tried this twice, but the room was just too small. Oooph this is getting painful. 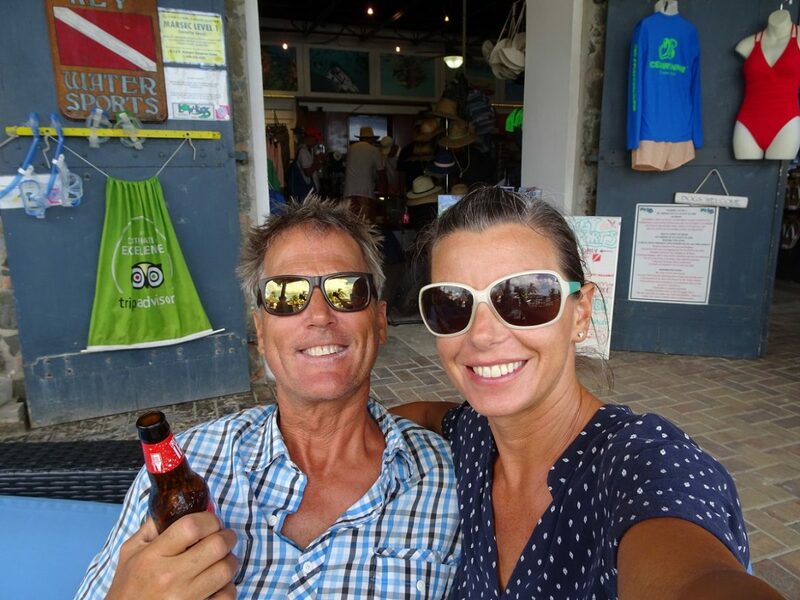 So we head back around the corner and pick up a buoy in Honeymoon Bay and dinghy the short distance to the CBP office (customs and border protection) back in Cruz Bay. Here we again join a long queue. And classic of US border control people, we have to wait in the hot sun outside even though there is plenty of room inside in the air conditioning. Finally, just as we have nearly melted, we get invited inside. “Oh you haven’t already filled the forms?” The officer says – like we were supposed to have miraculously plucked the forms from the sea on the way here! So having been handed the forms, we move to the table to fill them in … “no, no, not in here, go outside to fill them and come back when you are done”. What? Really? So we submit to fill in the forms while crouched in the shade of the fence outside. Once back inside following the usual barrage of inquisitive questions, and finger prints, the process is actually very quick. And, for once, free!!! Oh I wrote too soon…. as we walk back to the dinghy another official lady asks us the length of our dinghy. When we reply “10ft” she says, “then that’ll be $10 docking fee, please”. Seriously? And yes, she was serious. And she had a gun! Next stop is the parks office which is very nicely laid out and the people are tentative and informative (clearly they could never get a job with the CBP!). A lot of St. John is designated marine park which means we have to pick up buoys, not anchor, and they explain in detail including the self-pay pontoons. We then wander the town which has a really nice fell to it. It’s very American and very lively. Like a small holiday town. Lots of bars and places to eat, all full. Reminding us that Americans love their bars, even during the day. There are also lots of rental car places but each one we visit has the same response, no cars available for at least 2 weeks. And the prices are very high. $90 a day! With these prices there is no mistaking we are in the land of the USA holiday makers! After a cooling drink at the dive center we debate if we eat in town or back at the boat. The pizzas and junk are all very tempting but we opt for food on the boat where we can check if it’s rocking or not while we still have some daylight to move to a quieter place. Back on Cloudy Bay the boat is rocking but only due to the continuous passing of power boats at high speed – another thing to remind us we are in the USA. No other island has continuous wake from power boats. But this will all die down later when they all stop for the day, so we decide to stay on the mooring here in Caneel Bay, off of Honeymoon beach. In the evening we venture back into town to see what’s happening for St. Patrick’s night. The town is very lively, with most bars full. There is a band playing in the bandstand but it’s all local music. Further up the beach another band is playing rock. One of their songs is by Pink Floyd and they pull it off very well. But when they switch back to US rock we are a bit lost! The place that we really like in this town is Mongoose Junction. It’s an assortment of shops, bars and restaurants all set very pleasantly in tropical flora. There is another band there too but we only catch there last song of the evening. It’s not too late when we head back to Cloudy. And from our mooring we can just still hear the blaring music from the bandstand and we are glad we moored around the corner and not in the town!